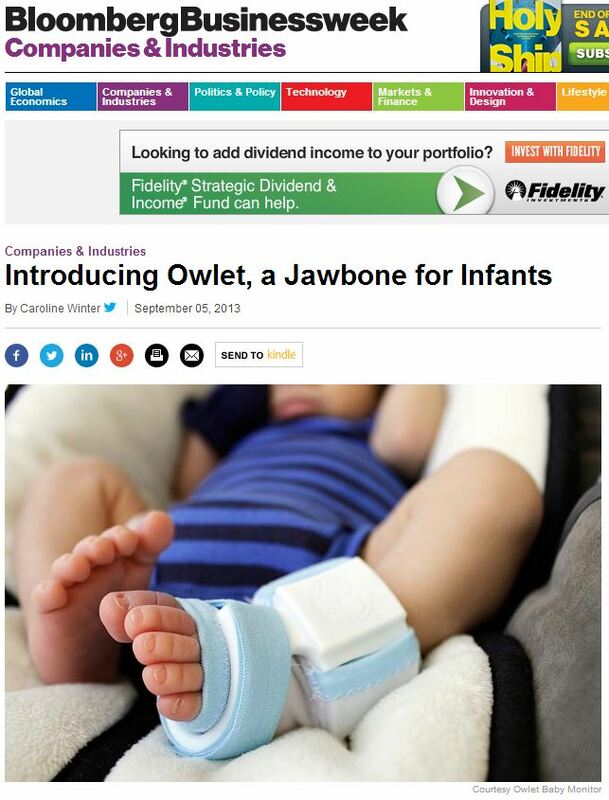 Congratulations to our Client OwletÂ Baby Care for their feature on Bloomberg Businessweek. Owlet Baby Care has created the worldâ€™s first baby â€œsmart sockâ€ that transmits a childâ€™s heart rate, oxygen levels, skin temperature, sleep quality, and sleep position (rollover alerts) to a parentâ€™s smartphone or other internet-based device. Kurt Workman Owlet Founder/CEO and father of a baby on the way; first had the idea when caring for his twin cousins who were born prematurely. He also had a cousin pass away from Sudden Infant Death Syndrome. The worry of whether or not an infant was getting enough oxygen was a personal one that hit close to home. The Owlet Vitals Monitor is also the first â€œwearable technologyâ€ in the infant space and is especially unique because it applies a safe, proven hospital technology in a new way: utilizing multiple sensors, so it can grow with your child. Â The monitor will continue to work as long as it fits the childâ€™s foot, and it has been beta tested on infants up to two years old. Find out more at OwletCare.com.